It was a regular Sewallcrest reunion at PSU for the Softcorre championships Sunday, as 2 Legit 2 Kick took on Ace of Base. 2 Legit was fresh off of a blowout win in the semis, while Ace of Base got to work on their stretching after advancing via forfeit. The rest paid off for the #2 seed, as the Melton family (Toni & Todd) brought some crushing kicks to the top of the lineup. Dan was roaming all over right-center snaring fly balls, and "Captain Tom" Cogswell locked it down on the mound. Congratulations Ace of Base on a hard fought victory in 70 degree "winter" weather. 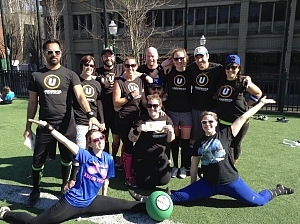 Another sunny Sunday of winter kickball, with well played games, the only difference this week, was its the playoffs. PBR won a wild first game, advancing to play against Ace of Base, which was another good game. Ace of Base was ready though, playing music and team ball, they were getting it done. Jessica was using her speed and hustling like usual. Bunting to get on, only to round'em and score. Adding a nice play at catcher and some dance moves behind the plate, it was a heck of a game. Great attitude too!